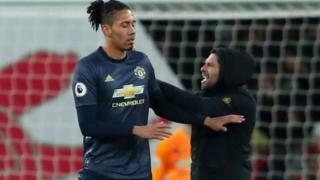 A man has denied assaulting Manchester United defender Chris Smalling during a Premier League match at Arsenal's Emirates Stadium. Gary Cooper, 30, of Styventon Place, Chertsey, Surrey, admitted invading the pitch but denied a separate charge of common assault at Highbury Corner Magistrates' Court on Tuesday. The charges relate to an incident about 70 minutes into the match on 10 March, which Arsenal won 2-0. Mr Cooper will next appear on 16 May.